Vietnam demands that the Chinese side immediately stop and not to repeat actions that violate Vietnam’s sovereignty and jurisdiction rights over its continental shelf and exclusive economic zone as well as pay damages for the Vietnamese side. The statement was made by Foreign Ministry Spokesperson Nguyen Phuong Nga at a press conference in Hanoi on May 29 regarding the case that Chinese marine surveillance vessels on May 26 cut exploration cables of the Binh Minh 02 ship of the Vietnam National Oil and Gas Group (PetroVietnam) when the ship was conducting seismic surveys on the continental shelf of Vietnam. 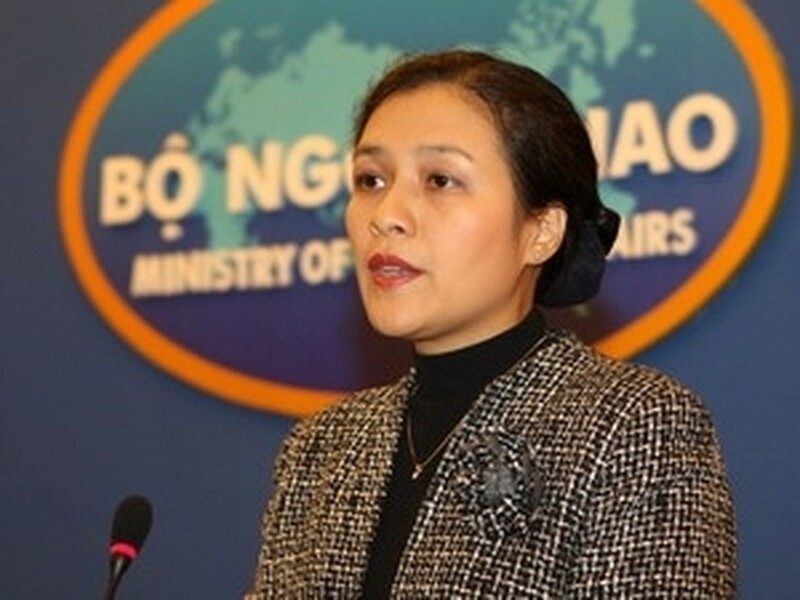 “Vietnam resolutely opposes the Chinese side’s action that damaged and hindered Vietnam’s normal exploration and survey activities on its continental shelf and exclusive economic zone, causing great damages for PetroVietnam,” she stressed. This action seriously violated Vietnam’s sovereignty and jurisdiction rights over its continental shelf and exclusive economic zone, breaking the 1982 UN Convention on the Law of the Sea and going against the spirit and words in the Declaration on the Conduct of Parties in the East Sea (DOC) signed between ASEAN and China in 2002 as well as the common perception of the high-ranking leaders of Vietnam and China, she added. Nga also rejected the Chinese Foreign Ministry Spokesperson’s remarks on May 28 that the Vietnamese side’s oil and gas exploration activities in the waters managed by China damaged the country’s interests and management right in “South China Sea”, going against the two countries’ common perception on the “South China Sea” issue and that the action taken by the Chinese governing body is merely a marine supervision and law execution in the China-managed waters. She explained that the area where Vietnam conducted explorations is entirely within the 200-nautical mile exclusive economic zone and continental shelf of Vietnam as stipulated by the 1982 UN Convention on the Law of the Sea. This is neither a disputed area nor an area “managed by China”. China is intentionally misleading the public opinion into thinking it is a disputed area. The spokesperson also pointed out that while China calls for solving relevant disputes through peaceful measures, its own action is making the situation in the East Sea more complicated. Do Van Hau, Deputy General Director of PetroVietnam, briefed reporters of the incident when PetroVietnam-owned Binh Minh 02 ship was blocked and threatened as well as had its cables cut by three Chinese marine surveillance vessels while conducting explorations at 12 degrees 48’25” north latitude and 111 degrees 26’48” east longitude, some 116 nautical miles off Dai Lanh cape in the central coastal province of Phu Yen. Hau emphasized that the seawater where PetroVietnam’s ship was operating is deep inside Vietnam ’s continental shelf. PetroVietnam has conducted seismic surveys in the area for numerous times and Binh Minh ship 02 operation within the seawaters under Vietnam ’s sovereignty is quite normal, said the PetroVietnam senior official. Hau said the Chinese ships’ cutting Vietnamese ship’s cables is a deliberate and well-prepared action. “It is impossible to cut cables at a depth of 30m under the water without special equipment,” the oil and gas exploration expert explained. “The incident has caused considerable losses and obstructed operations of PetroVietnam. The Binh Minh 02 ship and logistics ships had to stop working in order to repair the damaged facilities,” Hau said, adding that the Binh Minh 02 ship has so far resumed normal operation after the repair.